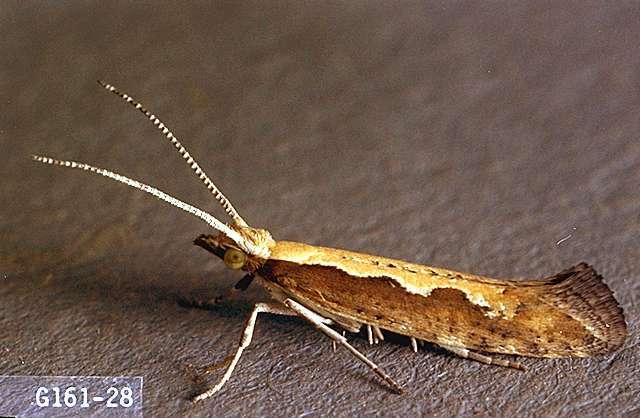 Pest monitoring Natural enemies and insecticides applied to control other pests keep the diamondback moth under satisfactory control in most fields, but keep records of diamondback moth as you monitor for other caterpillars. Adult moths frequently migrate from fields being harvested or disked under. In Minnesota, action thresholds for diamondback moth in cabbage are: Where diamondback moth is the primary insect pest (usually early-year), before cupping, treat with Bacillus thuringiensis if 50% of plants are infested with five or more larvae each. After cupping, treat if 10% of plants are infested with one or more larvae each. An action threshold for diamondback contamination of broccoli heads has not been established in Oregon. 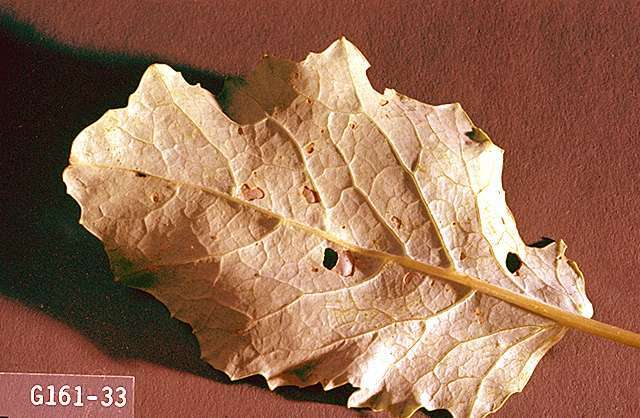 If fourth-instar larvae are on leaves when the broccoli head elongates, an early insecticide spray is justified to prevent larvae from moving up into the developing broccoli heads and forming their pupae. Preharvest clean-up sprays do not remove pupae from broccoli heads once they are formed. Natural enemies, including an ichneumid wasp and the egg parasite Trichogramma pretiosum, often effectively control diamondback moth in California. Therefore, take into account the level of parasitism when making control decisions. Clearly, Bt is much easier on the beneficial insects, and its use, when needed, helps conserve the beneficial insect complex. Bacillus thuringiensis (Bt)-Some formulations are OMRI-listed for organic use. acephate (Acephate 90WDG) at 1.0 lb ai/a. PHI 14 days. REI 24 hr. Do not exceed 2 lb ai/a per season. Retreatment interval 7 days. Do not feed trimmings to livestock or allow animals to graze in treated areas. Brussels sprout and cauliflower only. Bacillus thuringiensis (Javelin) at 0.12 to 1.5 lb/a. PHI 0 days. REI 4 hr. Slow acting. May need multiple applications. Add an appropriate spreader-sticker to enhance control. Most effective on small larvae. Some formulations are OMRI-listed for organic use. beta-cyfluthrin (Baythroid XL) at 0.019 to 0.025 lb ai/a (larvae only). PHI 0 days. REI 12 hr. Retreatment interval 7 days. Do not exceed 0.1 lb ai/a per season. bifenthrin (Brigade WSB, Sniper) at 0.033 to 0.1 lb ai/a. PHI 7 days. REI 12 hr. Do not exceed 0.5 lb ai/a per year. Retreatment interval 7 days. Do not exceed 5 applications after bloom. borate complex (Prev-AM Ultra) at 0.4% solution. REI 12 hr. Spray to complete retreatment interval coverage. 7 days. OMRI-listed for organic use. carbaryl (Sevin 4F) at 1 to 2 lb ai/a. PHI 3 days. REI 12 hr. Do not exceed 6 lb ai/a per crop. Retreatment interval 7 days. Do not exceed 4 treatments per year. chlorantraniliprole/thiamethoxam (Durivo) at 0.195 to 0.257 lb ai/a applied to the soil. PHI 30 days. REI 12 hr. Do not exceed 0.172 lb ai of thiamethoxam or 0.2 lb ai of chlorantraniliprole per acre per growing season. chlorpyrifos (Lorsban 75WG) at 0.5 to 1 lb ai/a. PHI 21 days. REI 24 hr (but 3 days for cauliflower). Do not exceed 3 treatments per season. cyfluthrin (Tombstone) at 0.038 to 0.05 lb ai/a (larvae only). PHI 0 days. REI 12 hr. Retreatment interval 7 days. Do not exceed 0.2 lb ai/a per season. emamectin benzoate (Proclaim) at 0.008 to 0.015 lb ai/a. PHI 7 days. REI 12 hr. Retreatment interval 7 days. Do not exceed 0.09 lb ai/a per season. Do not allow livestock to graze in treated areas. gamma-cyhalothrin (Declare) at 0.01 to 0.015 lb ai/a. PHI 1 day. REI 24 hr. Do not exceed 0.12 lb ai/a per season. Toxic to bees. indoxacarb (Avaunt) at 0.065 lb ai/a. PHI 3 days. REI 12 hr. Use of wetting agent recommended. Retreatment interval 3 days. Do not exceed 0.26 lb ai/a per year. 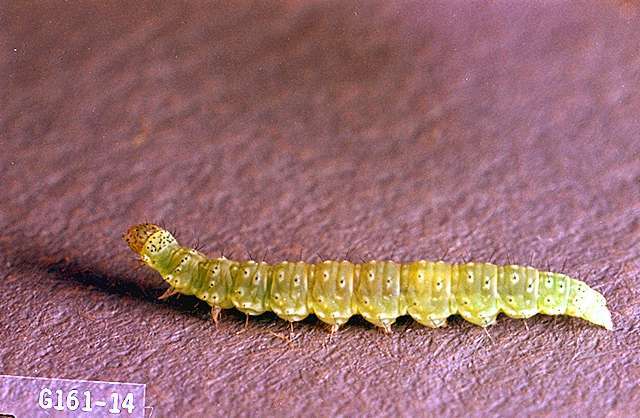 Insects stop feeding soon after application, but 3 to 4 days are required for maximum effect on lepidoptera larvae. methomyl (Lannate SP) at 0.45 to 0.9 lb ai/a. PHI 3 days for Brussels sprout, broccoli, and cauliflower, 1 day for cabbage. REI 48 hr. Do not annually exceed 5.4 lb ai/a for Brussels sprout, 6.3 lb ai/a for broccoli, or 7.2 lb ai/a for cabbage and cauliflower. Add a surfactant to improve coverage. naled (Dibrom) at 0.94 lb ai/a. PHI 1 day. REI 48 hr. Do not exceed 9.4 lb ai/a per year. Retreatment interval 7 days. Limit 5 applications. permethrin (Permethrin) at 0.05 to 0.2 lb ai/a. PHI 1 day. REI 12 hr. Do not exceed 0.8 lb ai/a per year on broccoli or 0.4 lb ai/a per year on cauliflower, cabbage and Brussels sprout. spinosad (Success, Entrust SC) at 0.023 to 0.063 lb ai/a. PHI 1 day. REI 4 hr. Treat eggs at hatch and small larvae. Do not exceed three times in a 30-day period or six applications or 0.45 lb ai/a per crop. Entrust SC is OMRI-listed for organic use.